It’s been a long, hard winter. Most of us in North America experienced a harsher winter than usual, thanks to Arctic blasts that kept temperatures well below normal and gifted us with more snow and ice than we’ve had in some years. Schools had many cancellations and delays, forcing make up days that will extend well into June. But even though the winter came at us hard, and we thought it may never end, spring is on its way. Yellow daffodils and purple hyacinths are out in full bloom. Our resident robin who built her nest on our drainpipe just hatched her four eggs. The grass is green instead of brown. The snowy days have given way to rainy ones. Our forsythia bush is starting to get yellow flowers on the end of the branches. 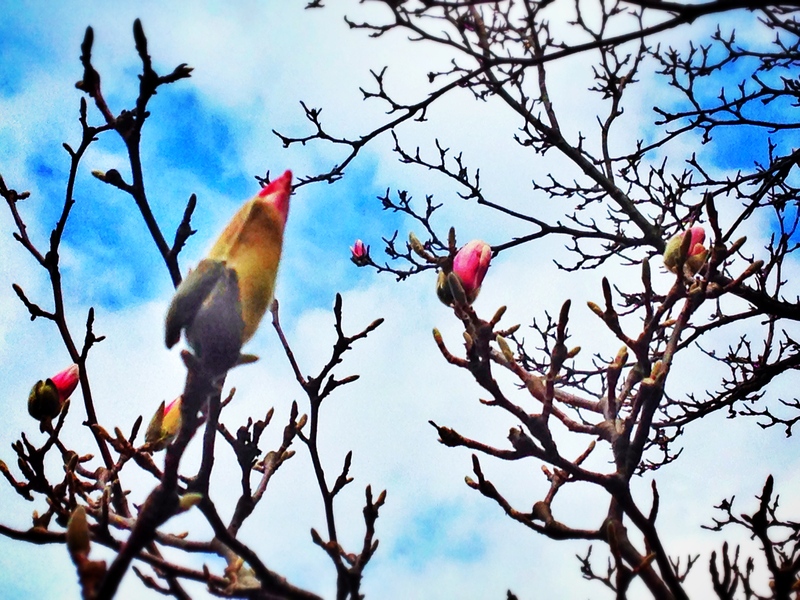 Even our magnolia tree is just starting to bud, and I counted a dozen buds on it just today. There’s no mistaking it. The signs of spring are in the air. Spring is finally coming. But not all of us are experiencing spring. Some of us have been stuck in a figurative season of winter so long we no longer remember what spring feels like. I’m there. I’ve been there for a long time. It’s been a long, hard winter, and here’s the thing. I don’t know if spring will ever come. I know there are those of you who know exactly what I mean when I refer to a “winter” period of life. I imagine there are also people who don’t get that analogy because they’ve never experienced it themselves. Have you ever been hit with devastating news that knocked the breath out of you or even turned the course of your life around? I have. That’s winter. And sometimes the best you can hope for is to just survive. Bundle up, hunker down, and live one day at a time. It’s hard. Really hard. Winter’s icy blasts make it difficult, even painful, to breathe sometimes. Trudging through the deep snow saps your energy. You start to believe that winter will stick around forever. But there’s hope. Spring is coming. In the church year we just sojourned through the long, somber season of Lent. We suffered through the harsh realities of the events of Good Friday; events that included suffering and death. You can’t get much more “winter” than that. But just as sure as spring buds follow the snows of winter, so Easter follows Lent. Yes, Jesus died on that cross. Yes, it was our fault. Yes, we should feel our guilt over that cold reality. But that’s not the end of the story. After death came life. Jesus burst forth from that tomb a mere three days later. To the disciples, those three days must have felt like an eternity, but in retrospect it was really a short time. The empty tomb is our promise of spring, our guarantee that someday we too will live forever in heaven, in eternal spring, so to speak. The hymn Alleluia! Jesus is Risen! puts it like this- “City of God, Easter forever!” Can you even imagine that? Can you imagine celebrating the resurrection forever? You know the excitement and joy you feel on Easter morning when the church is packed, you can smell the Easter lilies, the organ is loud and full, and you’re surrounded by fellow believers singing praises to Jesus all together? Easter forever. Eternal spring. Yes, spring is coming. But in the meantime, here we are. We aren’t experiencing Easter forever. Some of us are still in the dreary season of winter. What can we do? Bundle up, hunker down, and live one day at a time. First, bundle up. When it’s cold out, we wear layers of clothes to keep warm. Do the same in a figurative winter. Only instead of clothes, bundle yourselves with the armor of God, as we read in Ephesians 6. Wear the belt of truth, the breastplate of righteousness, the shoes of the Gospel of peace to help you stand, the shield of faith, the helmet of salvation, and the sword of the Spirit, which is God’s Word. Search the Bible for comfort, encouragement, and God’s promises. Bundle yourselves with the power and warmth of God’s Word so as to withstand whatever storms life throws at you with your faith intact. Next, hunker down. Ground yourself in prayer. After discussing the armor of God, Paul exhorts us to “pray at all times in the Spirit, with all prayer and supplication” (Ephesians 6:18). I’ve found that in my own winter season I’ve prayed more than ever before. I’ve found comfort in Scripture in ways I never could have imagined when I was blissfully enjoying the warmth of spring. And even if my exterior circumstances have been less than ideal during my winter season, anything that drives me to my knees and to God’s Word cannot be a bad thing. Lastly, live one day at a time. Again in Ephesians 6, what does Paul say? “Put on the full armor of God, so that when the day of evil comes you may be able to stand your ground, and after you have done everything, to stand” (Eph 6:13). He exhorts us to stand, not to advance. Because of Jesus, we are already where we need to be. Yes, we will face struggles in this earthly life, and the whole purpose of the armor of God is this: God doesn’t leave us alone in our struggles here. He gives us this armor to protect us from the devil’s assaults so that one day we will see the realization of the faith Jesus won for us. Remember and take Jesus’ words to heart- “Do not be anxious about tomorrow, for tomorrow will be anxious for itself. Sufficient for the day is its own trouble” (Matthew 6:34). God gives you strength enough to get you through each day. He gave the Israelites manna in the wilderness one day at a time. He was teaching them to trust that He would indeed provide just enough of what they needed for the day. Perhaps He does the same today. God won’t give me Herculean strength to tackle all my problems head on, all at the same time. But He will give me strength for this one day. And that’s enough. I don’t know what your “winter” season is, dear one. I don’t know if you’re already in spring or if you’re still stuck with me in winter. Some people’s winters are shorter than others. Just like our daffodils bloom before our magnolia tree, so some people enter spring earlier than others. And I can’t make any promises that this side of eternity you’ll see spring again. You may not, honestly. But take heart. Look to the empty tomb. Look to the promises of God in His Word. The signs of spring are there. Yes, dear one, spring is coming. Some of my winter seasons lasted through spring, summer and fall of two complete years. Spring is finally here for me, but I have more empathy for those still in their winter season. Thank you, Ruth!